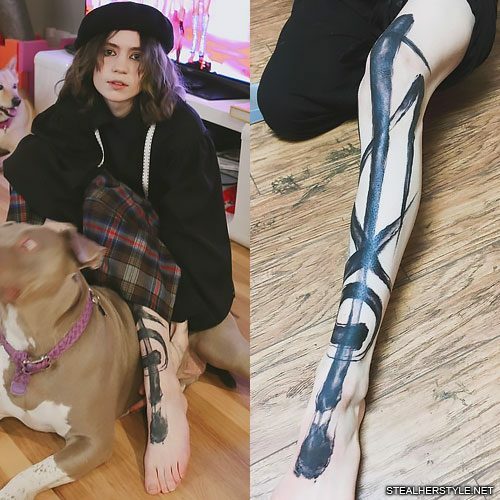 Grimes got this huge brushstroke tattoo on the front of her left leg from London-based artist Delphine Noiztoy at LoveLetters tattoo parlor in Los Angeles in January 2017. 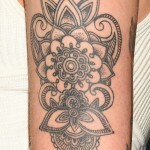 The creative blackwork design stretches from just above her knee all the way onto the top of her foot. 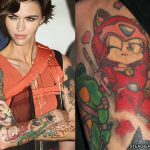 The brushstrokes spell out the letters “тихо” which means “quiet” in Russian. 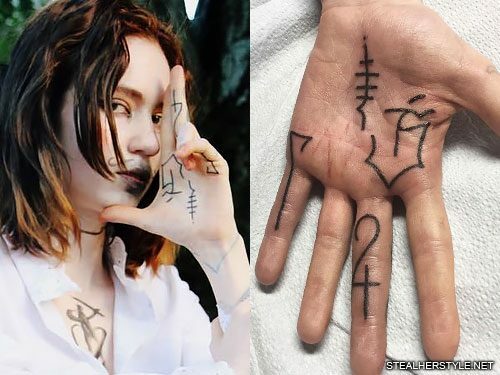 Grimes showed off a new finger tattoo in a November 2016 instagram photo. 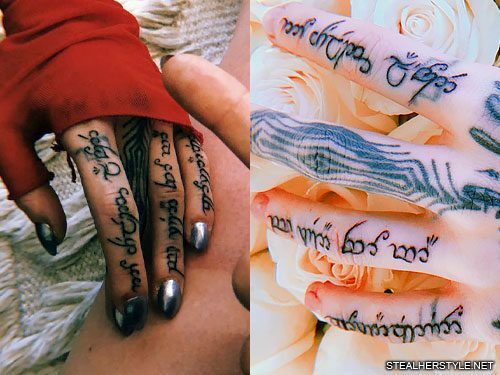 Artist Delphine Noiztoy created a geometric blackwork design, covering her whole middle finger with concentric shield shapes. 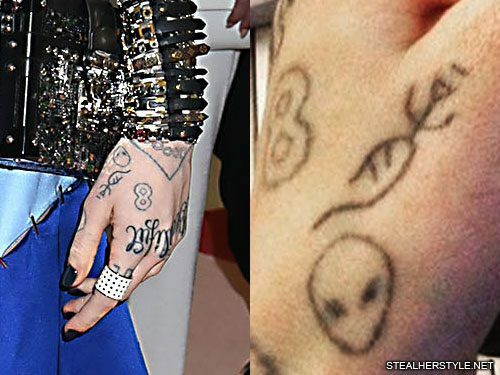 Grimes has tattoos on the side of her left hand of an alien head and a little symbol. 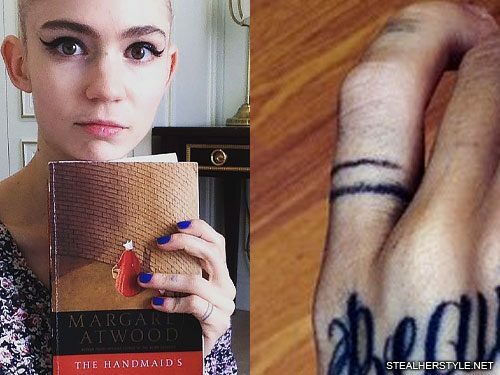 Grimes has two bands around the base of her left pinkie finger, like a ring. 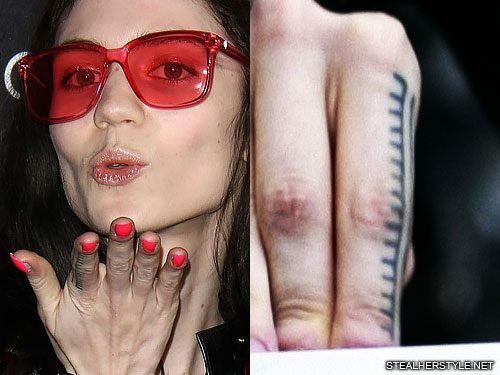 Grimes has a geometric design of lines tattooed on her right index finger. 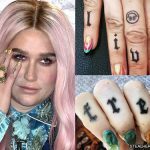 There are two lines running along the length of the finger. 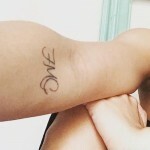 One is un-ornamented while the other has many short perpendicular lines branching off of it. 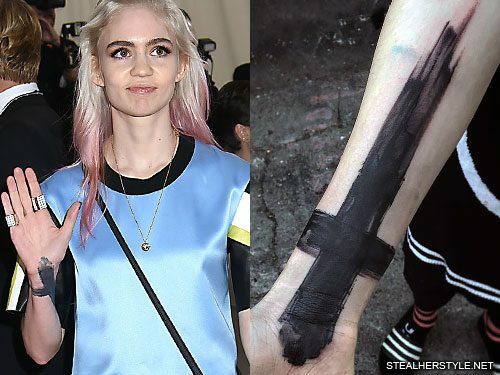 Grimes got this huge brushstroke tattoo on her right forearm in December 2015. 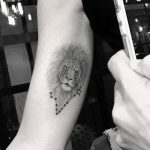 Although most of her other tattoos have been done by herself or friends, this one one created by Delphine Noiztoy, an artist who specializes in realism blackwork. 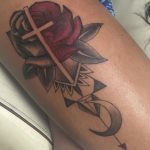 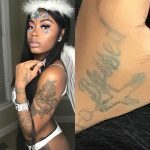 The tattoo is a redesign of her existing cross tattoo, which was smaller and more ornate.